Spreading evergreen perennial with rounded hairy green leaves. 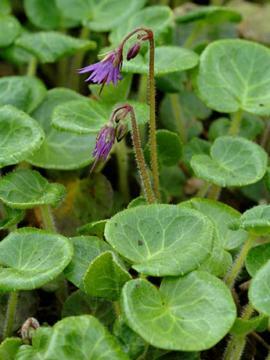 In spring slender stems carry small nodding, bell-shaped, dark violet-purple flowers with fringed petals. Humus rich, moist but well drained, neutral to acid soil, in a cool position in sun or part shade. Dislikes excessive winter wet.